January 23, 2018 signified a landmark moment for Italian business and politics. For the first time, a group of 80 B Corps from across Italy joined together to appeal to the future leadership of the country, to remind all political parties and their candidates of the imperative of sustainable development for the upcoming elections on March 4. 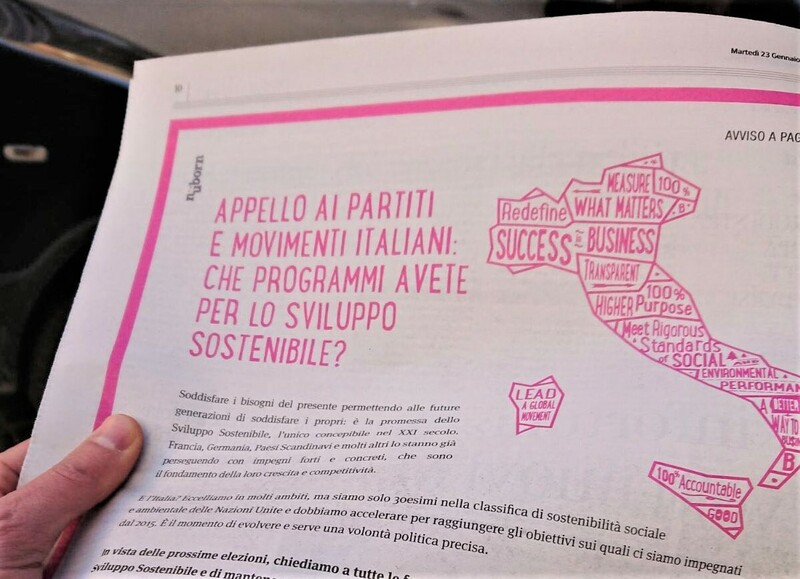 Taking out a full-page ad in Corriere della Sera, a premiere business and political newspaper, the community of entrepreneurs and citizens of Italian B Corps asks that social and environmental sustainability objectives be incorporated into electoral platforms. In the call-to-action, launched on www.BtheChange.it, the B Corps point out that Italy is a country with extraordinary potential of people, territory and creativity, and that sustainability can help Italy “reach our potential and creating new opportunities and job growth.” Other European nations with sustainability as a driving force have become more competitive. The appeal calls for “all political forces to clearly detail their sustainable development objectives” and to deliver them during their time in government. The objectives refer to the United Nations 2030 agenda, to which Italy has adhered in 2015. Another B Corp speaking for the movement is Davines, a family-owned hair care brand from Parma. Owner and chairman Davide Bollati accentuates that sustainable business can be a source of national pride. The Italian B Corps unite their voice with ASviS, the Italian alliance of 180 organizations and networks dedicated to sustainable development. The 80 Italian B Corp “activist” companies are part of a global movement of thousands of companies around known for being “best for the world.” B Corps adhere to the highest standards of environmental and social sustainability, promote legal forms like the Società Benefit, and invite other companies to do the same. Their objective is to accelerate the evolution of economic and political models to create a lasting and equitable future.